We took the boys caving this past weekend. Caving in the sense of a guided tour. I'm not the type to go for headlamps and scrambling by belly through 12 inches of crawl space. Nope, not for me. 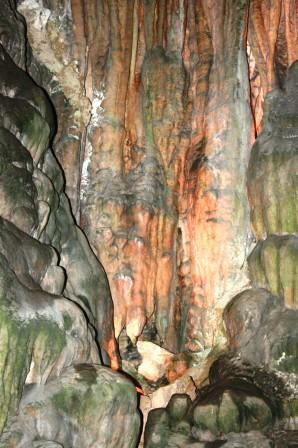 But I do enjoy the tourist style caving. It turned out to be a great activity for a day that would reach 90* with high humidity. As soon as we walked through the doors of Dixie Caverns, the cool air beckoned. As did the mysterious rock formations. It was dark and damp, but things were well lit (except for a few times they turned off all lights to show us how the cave would feel naturally). The boys actually did well holding hands and sticking close. 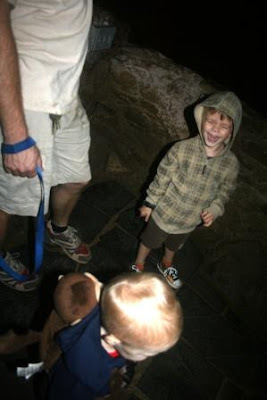 I guess self-preservation instincts tell even the adventurous toddler not to run off in a cave! This reflecting pool was interesting, because it was a few inches deep, but when they turned off the lights it reflected off the ceiling above it, and appeared to be about 3 feet deep. 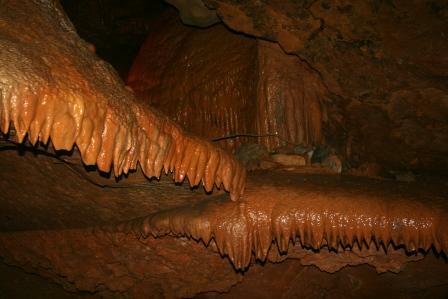 This formation was called the wedding bell, because over 100 couples have been married beneath it. And this kind of made me think of The Descent. Anyone read it? Great book - thriller style! So fun! We went spelunking this past weekend as well! OH as beautiful as that is there is no way I would go down in a cave.. I hate the idea even scares me to death..
Great Family fun. I know you all had a blast. Now THAT is a field trip! Wow. Don't know if i could do it as i am petrified of small spaces. I cannot believe people got married in there. Its sure beautiful under ground. The treasures i miss!!! I looks like your little monkeys had a wonderful time! Omg, those rock formations are creepy! They look like tentacles! Whew those photos had me feeling the need to breath LOL. 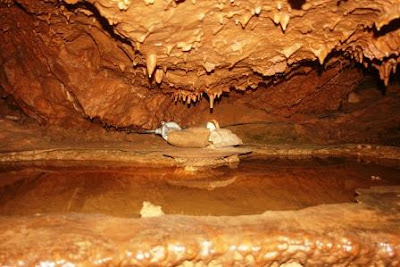 I am claustrophobic so going into caves guided or not, ummm nope I will wait up top and hold everyone's stuff okay :O). I love that Elmo went to see the caves too :o). Cute picture! I Love these cave pics! They are so neat...your 3 little monkeys are so cute too! Those are some great memories you've made there!! 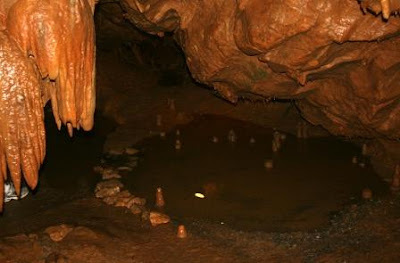 Sure wish I could walk into the coolness of those caves right now! That looks like so much fun! I love all the great adventures you and your boys (including your husband) have! LOL! that last shot and your comment... ha!!! yeah, with 3 little boys, i'd be doing the guided tour too!!! We did our first family cave tour last summer. LOVED it. I've been in there! I loved it. 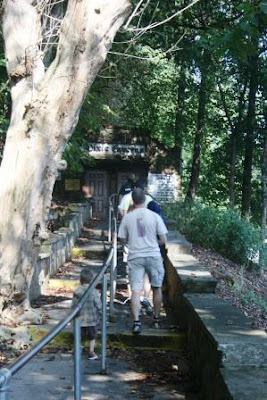 My family used to tour caves/caverns all the time when I was a kid. So cool! 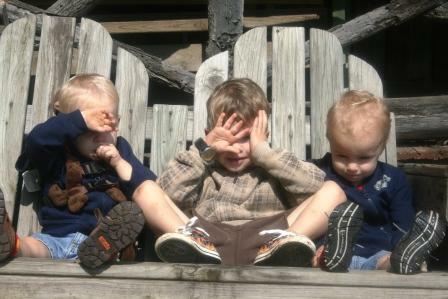 That last photo of the boys is too cute! What a great adventure to take your children on!! I love exploring and seeing new things. 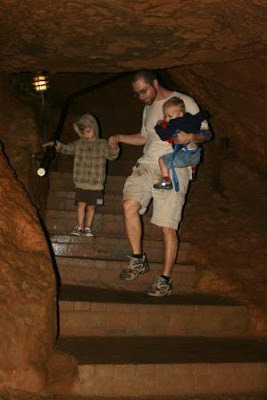 I am just not big on caves where as my husband and our children love it!Looks like a great fun family outing!! I've never been caving but I would go and I think my kids would be enthralled by it. You are adventurous parents! Love it. Your last photo is so darling! Glad you all had a good time. The last time I went into a cave and they turned the lights out I yelled for them to let me out. ha! I have not read the book but I have seen the movie, and it has ruined me for cave exploration. Looks cool, though. What adorable little boy, Lisa... I love seeing their photos. That last one is awesome. 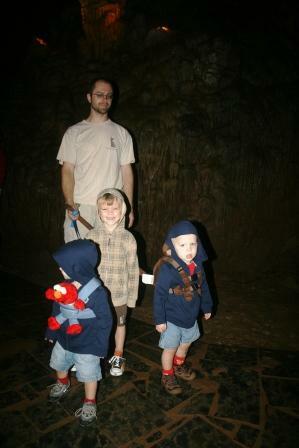 We went to Mammoth Cave a few years ago.... Even as an adult, I really enjoyed it. Can only imagine what it would mean to a child! You got really good pictures, I'm glad the boys liked it! We went to Luray Caverns on our honeymoon 41 years ago, can you even imagine it? I taped a book for the blind about caving for blind people! I been in a few caves in my time. You really got some good photos there. Especially the last one. I emailed you an answer to the question about radios and chickens. I can't tell if it went through. Please let me know if you didn't hear from me. Looks like the boys had a great time! I kept thinking throughout the post about how you dress the twins alike if you ever dress Pierce like them too? I have been guided caving before. It was very beautiful, but my son in law goes caving in un guided caves. Very dangerous if you ask me. Looks like fun and my kids never like it when they turn those lights off! It's been a long time since I've been in a cave. I'm not sure I wouldn't get panicky in my old age! The rock colors and formations are so neat. You have some awful good boys to walk all that way and still able to laugh! Sounds like it was the perfect outing for your family!! I would love to go on a guided cave tour sometime. Just no tight spaces. We did caves this year as well. Awesome! Looks like you all enjoyed it as well. 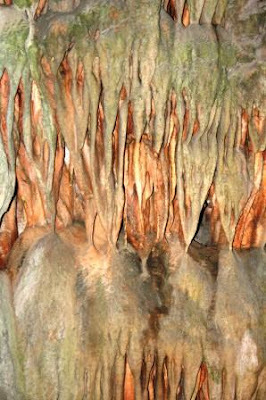 Great cave pics! 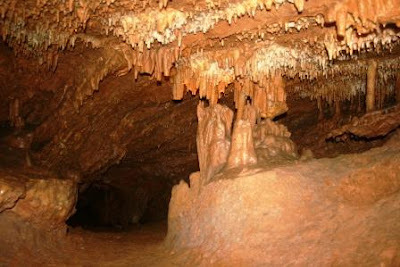 I can't wait until the kids are ready for us to take them to Mammoth Caves -- Right now our oldest is still a little scared of stuff like that. Those pictures are awesome! I love how active your family is!